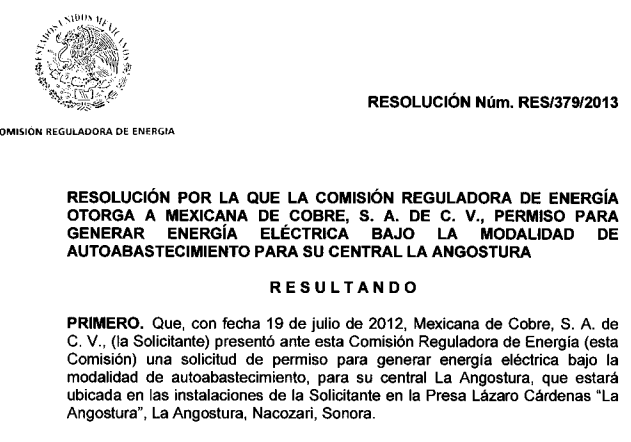 Image of 1912 governmental order giving Grupo México’s Mexicana de Cobre’s mining and metallurgical operations known as La Caridad permission to generate electricity with no fee from a planned hydroelectric plant Grupo México is building on the La Angostura dam. The National Water Commission (Conagua), State Water Commission (CEA), and Grupo México have been forthcoming about the consumption and contamination of water in the Yaqui River basin. The federal government’s environmental agencies have ignored Grupo México’s systemic disregard for the environmental consequences of their operations. 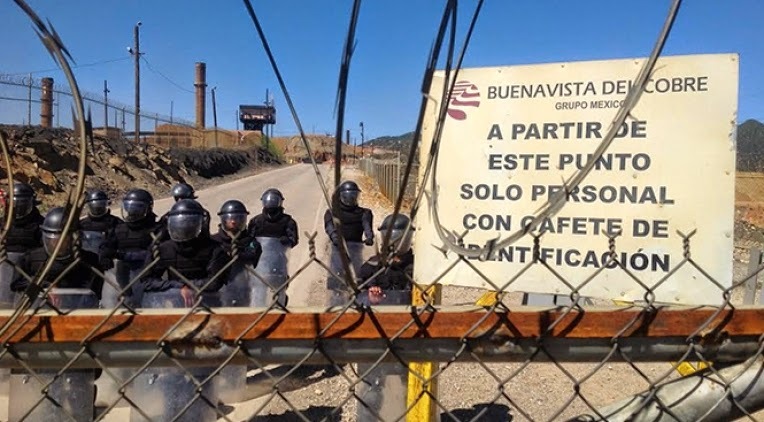 And neither the federal government nor the state of Sonora have protected the ejidos and towns near its mines from displacement and environmental contamination, despite a long history of complaints. Grupo México’s La Caridad mine and metallurgical complex near Nacozari de Garcia is a tightly guarded enclave. Situated next to La Angostura – Sonora’s first major dam and reservoir – La Caridad has since the construction of the dam been its major beneficiary. Mexicana de Cobre operates one of the three acueducts that pumps water from Yaqui River basin. 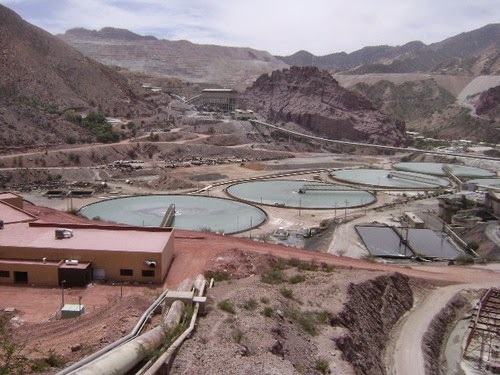 The pumping station at La Angostura transfers a reported 26 Mm3 of water to the company’s copper and molybdenum mining operations and processing plants. Under a 1991 agreement between the Yaquis and Conagua and CEA (opposed by committees in Vícam and Pótam but signed by eight governors), the Yaqui-Guaymas aqueduct transfers 22Mm3 of water from the Yaqui Valley to Guaymas, Empalme, and San Carlos. The Independencia aqueduct has the capacity to transfer 75Mm3 from the middle Yaqui River basin at the Novillo reservoir to Hermosillo. The exact amount of water that Grupo México’s Mexicana de Cobre complex extracts from the river and by its wells within the vast complex – encompassing 104,990 hectares – is not publicly known. However, the three aqueducts alone extract 123 Mm3 of water from the Yaqui River basin – which is about 20% more than the total capacity of La Angostura. When ordering the construction of La Angostura, President Lázaro Cárdenas decreed in 1940 that the Yaquis had water rights to half the reservoir’s capacity – but these promised water rights have never been implemented, which helps explains the vehement Yaqui opposition to the Novillo-Hermosillo aqueduct. Nacozari de García is a quintessential mining town. It is also the closest large town to La Angostura, which lies about 20 miles to the city’s southeast. Despite its proximity to the reservoir and its role as Grupo México’s offices for La Caridad, the city has for decades suffered severe water shortages. While the mine has free access to the reservoir, neither the mine nor the government has created the infrastructure necessary to supply Nacozari with water from Angostura. In contrast, the federal government allows Grupo México to exploit La Angostura as it pleases. The federal government’s privileged treatment of Grupo México continues from sexenio to sexenio, whether PAN or PRI presidents. A recent example of how the federal government gives Grupo México free rein exploit the country’s natural resources is the company’s plan to tap into the dam’s hydroelectric capacities – without regard to environmental impacts, Yaqui water rights, or impact on other traditional users of Yaqui River water. Before seeking approval of the federal energy commission, Conagua on September 29, 2010 had granted Grupo México a water-use permit (“título de concesión”) to “exploit, use, or take advantage of national surface waters amounting to 416,669,000 cubic meters of water annually.” Conagua reports that La Angostura has a capacity 864 Mm3 although other Conagua reports note that effective capacity because of silt accumulation has decreased to 700 Mm3. The Conagua permit was issued without any environmental impact study. The permit for Grupo México to use such immense quantities of water in the upper Yaqui River basin came at the time that the anti-Novillo-Hermosillo coalition was organizing large demonstrations. The Yaquis were formulating legal cases against the aqueduct that, among other things, asserted that SEMNARNAT’s environmental impact statement on the aqueduct was grossly inadequate since it didn’t take into account the impact on the river because of reduced flows. La Caridad copper mine adjacent to La Angostura dam and reservoir with aqueduct in foreground. Understandably, the focus of the anti-aqueduct coalition was on the Conagua-approved and -financed transfer of water from the Yaqui River basin to Hermosillo in the depleted Sonora River basin. Conagua tried to assuage the coalition’s concerns that the aqueduct would leave the lower Yaqui River basin without a dependable supply of water, especially during droughts with the still-unconfirmed story that it had bought water rights from small farmers in the middle river basin. What the federal water agency didn’t say – and still hasn’t acknowledged – that the highly questionable water permits issued to Grupo México and other mining operations constituted were responsible for vast withdrawals of water from both the Sonora and Yaqui basins. Prior to the federal energy commission’s approval of Grupo México’s permission, the company had also succeeded in securing a favorable ruling by SEMARNAT, the federal environmental ministry. SEMARNAT determined that there would be no need for an environmental impact statement for the hydroelectric plant to be operated by México Generadora de Energía (MGE). Grupo México created MGE in 2005 and received approval by the Energy Regulatory Commission to generate electricity for the company’s mining and metallurgical operations in Sonora. Grupo México told its stockholders that MGE would produce electrical energy to its Mexican open pit mining operations “at a discount of the cost charged by CFE (Federal Electricity Commission).” Grupo México boasted that its MGE subsidiary formed part of the company’s commitment of strengthening its mining division position as one of the world’s low cost producers.”[iv] Grupo México has not reported if the planned hydroelectric plant is currently operating, although it has installed two gas-turbine generators at La Caridad. Although not mentioned by Grupo México, free, easy, and irregular access to water in Mexico is likely one of the reasons that transnational firm is one of the world’s low cost producers. Like the “irregular” water permits issued by Conagua to Grupo México, the federal energy regulatory commission’s authorization was also irregular. The commission issued its authorization in September 2013 for the construction of the company’s hydroelectric plant in September 2013 but Grupo México had been busy constructing the facility since July 2012. In other words, the commission ruled on Grupo México’s request at mid-point in the construction process, creating the assumption that Grupo México had been assured of the commission’s approval. While this process was on the face of it irregular, it is the regular process of corporate-governmental relations in Mexico. This history as a heavily indebted government enterprise established a pattern of free access to water and the lack of enforcement of environmental, land-use, and occupational safety regulations. Essentially, La Angostura functions as Grupo México’s private dam and reservoir. Except for one access road to the reservoir for tourists and fishermen, Grupo México strictly controls the dam from the west and south. What is becoming clear that the government and the mining industry need to be more forthright about water-consumption and water-contamination by the miniWhile primarily a Mexican concern, the boom in mining exploration and extraction in Mexico’s northern borderlands – in Baja California, Sonora, Chihuahua, and Coahuila, especially – has international repercussions. The impact of operations of such companies as Grupo México, Peñoles, and Grupo Frisco don’t stop at the international border but are putting at risk the quantity and quality of transboundary surface water flows and groundwater basins that span the border. [ii] “Resolución por la que la Comisión Reguladora de Energía ortorga a Mexicana de Cobre, S.S. de C. V., permiso para generar energía eléctrica bajo la modalidad de autobastecimiento para su central La Angostura,” Comisión Reguladora de Energía, Núm. RES/379/2013, 19 de septiembre de 2013. [iv] Grupo México, press release, n.d., at: http://gmexico.com.mx/files/PRMGGEINICIAVENTAING.pdf Before it began work on the hydroelectric plant, MGE, which is based on Grupo México’s property alongside La Angostura, was operating two gas-fired electricity generating plants at the La Caridad and Buenavista mining complexes. The Federal Energy Regulatory Commission had approved the creation of MGE in 2005 for the purpose of operating gas-fired plants, and it wasn’t until later in the decade that Grupo México came before the commission with the request for a MGE-run hydroelectric plant.“ S&P Rates MGE,” Reuters, Nov. 16, 2012, 2012.